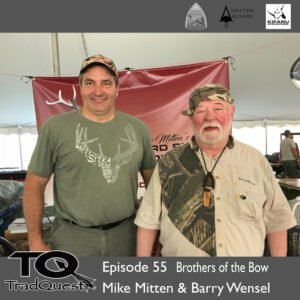 In this episode we got to sit down with Barry Wensel and Mike Mitten at the Compton Rendezvous. Legends of traditional bowhunting for sure they should not need an introduction. These guys are an absolute riot and we talked most things bowhunting…from solo hunting to whitetails and a little Paul Schafer in there too:) Both of them have new videos out so make sure to pick them up at brothersofthebow.com and herdbullproductions.com.